Misawa is a large joint Japanese/US base in the North of Japan and home to a large variety of aircraft, including JASDF F-2s, T-4s, E-2s and CH-47s. Two squadrons of WW-coded USAF F-16s, a P-3 Orion detachment and even a small civil terminal make this a very busy location on many people's list of locations to visit. 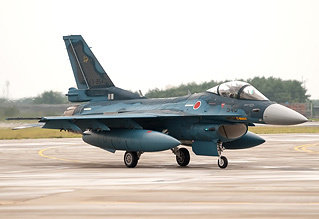 Following on from last week's report from Hachinohe, Mike Leonard completes his two-part review of a Japanese airshow double header. Misawa Open House is usually held annually in mid September, with this year's taking place on September 19th, the day after the nearby Hachinohe Open House. It is one of the highlights of the Japanese airshow season, attracting large crowds and a wide variety of flying and static display aircraft. A bonus for the spectator, and especially the photographer, is the 2km-long crowd line with the sun at the crowd's backs for the whole day, providing first-rate photographic opportunities, so long as the weather plays ball! Combined with the fact that this isn't one of the easiest places to view from outside, this makes Misawa a "must-attend" event for many enthusiasts who travel here by scheduled flight directly into the Civil terminal on the airfield, or those who come by Shinkansen train or even braving the 7 hour journey by driving direct from Tokyo by car! As per all US military installations post 9/11, security can be tight and non-US or non-Japanese citizens are advised to check before attending. Compared to previous years the US static displays appeared to be relatively sparse, possibly due to the poor weather in Misawa and the tropical storm passing many of the bases in the south of Japan which could have caused many participants to have to cancel. Highlights from the US was a B-52 from Minot and Korea based A-10s and of cause numerous examples of based F-16s. On the Japanese side the gems were special 50 year anniversary markings on a locally based 8 Hikotai F-2 and Hachinohe based UH-1 with shark's mouth markings. Despite the low cloud and rain throughout the day, this year's flying display featured a joint American/Japanese opening formation fly-past from the based F-2 and F-16s, followed by ACM demos by F-2, F-16 and 2 JASDF F-15s flying in direct for their display from Chitose. Also present were Misawa regulars including a role demo by the based CH-47, showing off its abilities as a water bomber, and what appeared to be a regular mission from a based E-2. The highly popular Blue Impulse national display team performed their flat routine due to the bad weather. The highlights of the flying display however usually come from the USAF. In 2009 the Thunderbirds, a B-52 flyby and nimble display from a C-17 had entertained the crowd. This year a U-2 flyby and an A-10 role demonstration were scheduled, however the U-2 unfortunately cancelled on the day - perhaps because of the worsening weather. 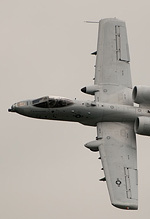 The impressive A-10 demo went ahead, with the low cloud and mist causing condensation and vortices from the wingtips during a most impressive display. Late in the show a scheduled arrival and go-around by a Travis based C-17 provided some consolation to make up for the lack of the U-2, however by this time the dark clouds and rain meant photos where becoming difficult. Once again, and for the second time in a weekend (see Hachinohe report) the opportunities to watch the departures, or take a more leisurely look at the static at the end of the show where hindered by heavy rain and wind that caused most people to seek shelter in the open hangars. Nontheless, a great weekend's aviation in Japan!